Success Is Found When You Are Being YOU! 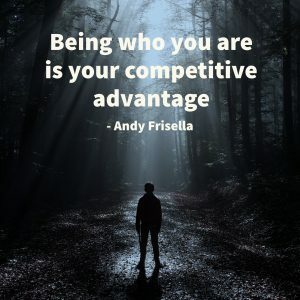 Earlier this week I was listening to Andy Frisella’s latest podcast and he made this quote, “Being who you are is your competitive advantage”. It’s funny, actually sad, that when you were young your number one goal was to fit in, to make friends by doing the “cool” things, to do whatever it took to blend in and be accepted into whatever crowd you had your sights on. Instead of growing up secure in your own identity and confident with your own personality you grew up and, in many cases, are still trying to figure out “WHO” you are. Let me encourage you today – throw off the mindset of trying to be who “THEY” think you should be and be who YOU are. In the end YOU will be noticed, accepted and find your place of success and fulfillment because you are being you and that IS YOUR competitive advantage. When you make the decision to cooperate with your strengths and personality you will find success. When you stop trying to fit into someone else’s perception of you, you will find success. When you stop trying to cram a square peg (YOU) into a round hole (NOT YOUR STRENGTH) and focus on what you do well you’ll stop living in anxiety and fear and start living in your own success. 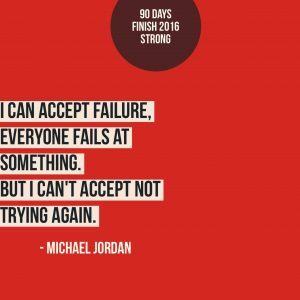 Are You Fed Up With Failure? This post is part of the Last 100 Days of 2016 Series. As of today there are 90 days left in 2016, what will you do with them? How many times have you tried something only to fail? If you are breathing you have had a long history with failure. When you were learning to ride a bike, you would fall, get back on and start pedaling and trying again. Go back a few years before that when you were learning to walk, you would fall, get back up and try again. Think about your career; a growing and thriving career requires that you continually learn new things. And let’s face it, most times, we don’t pick up new skills right away – it usually takes a while. When failure presents itself it provides you with the opportunity to make a critical decision. And that decision is this; will you try again OR will you give up? Will you make the decision to go after that gaol one more time OR will you become stuck in regret? Trying again starts with your mindset. If your head, your mind, isn’t in the right place the ability to try again is almost non-existent. Here are three practices that will help you maintain a strong mindset that will enable you to try again and not give up. Instead of labeling the failure as the end all reframe failure as a learning experience. Step back and take a look at what worked and what didn’t work with your plan. Learn from it but don’t take it as a death sentence. One of the greatest enemies to trying again is fear. You begin to think you can never do the thing you’ve set out to accomplish. You let fear tell you that you don’t have what it takes. You let the fear of what others will think of you “trying again” hold you back. You have to put on your boots, face your fears and then…with those boots…KICK FEAR IN THE FACE!!! Surround yourself with people who will pick you up and push your forward. Good people and good relationships are good for the soul. After you have experienced some kind of failure you don’t need people around you that will bring you down even more. Find people that want the best for you and tap into their positive energy and encouragement. Remember – it’s only failure when you stop trying – don’t stop – keep going!